More handmade customised dice...and another birthday present. It has been a couple of weeks since my last post, and I've been busy with a variety of projects. I had a couple of orders for some customised fluoro dice. So far I've only made dice using 6 lettered names - Murphy, George, Maisie...but this time as well as an Oliver I had an Anna! Names with less than 6 letters are no problem, I just added a couple of fun shapes on the other faces. Not sure that I can think of a solution for longers names though! We had another birthday party to go to, and I decided to make a pair of Racer Shorts from a plaid mickey mouse cotton. Mickey is one of the birthday boy's favourites and the shorts should be perfect attire for a week in Cornwall (fingers crossed!) I'm afraid that I left making them until the very last minute which meant that as soon as they were finished they were wrapped and taken to the party. No photo! Oops. With these projects completed I am finally able to start on my man-sized challenge! 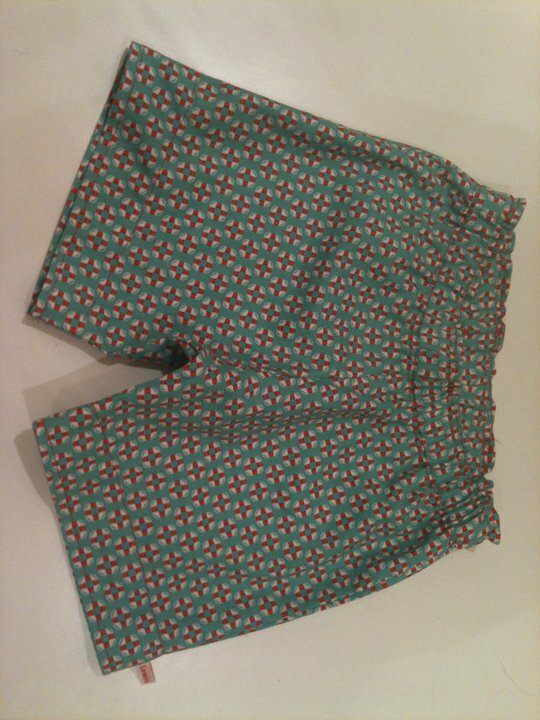 You may remember that I made some shorts for the Celebrate the Boy Summer event? Well, they were not only a hit with Wiss but a colleague at work fancied some for himself too. The challenge: to make one pair of tailored shorts to fit a 28 year old man using the Life Preserver fabric in the Snorkel range from Cosmo Cricket. Hmmm, no elasticated waist then?! I've bought the pattern and all the fabric I need. Now all I need to do is concentrate. Very hard! I know what I'll be doing this bank holiday weekend...hope you enjoy yours too!